What Silicon rectifiers for HT? 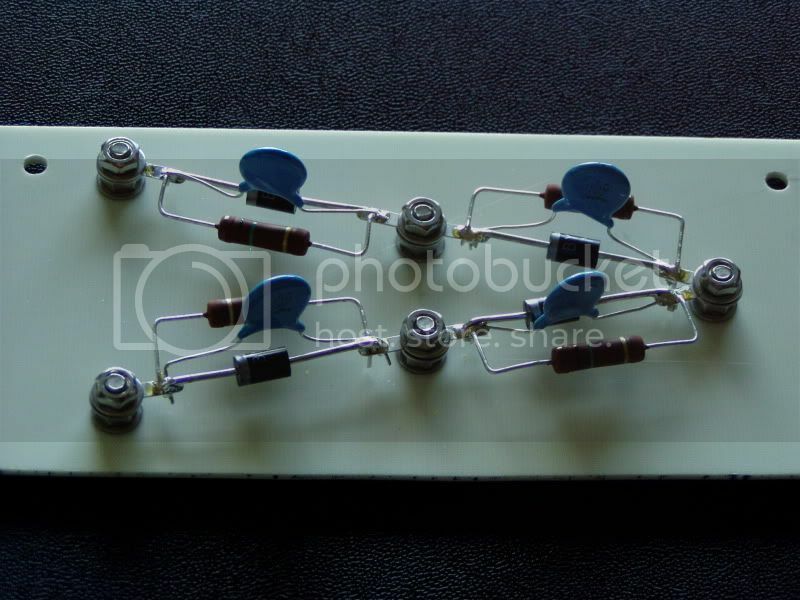 Re: What Silicon rectifiers for HT? I'd consider something like this. I quite like hybrid bridges. This was part of one that I used on the mighty 833a monoblocks, and now used on my GK-71 monoblocks. Can't remember what diodes they were, but I could find out if you are interested. Note the cap and resistor bypass as per Morgan Jones. I've been in the habit of bypassing silicon rectifiers for a long time now Philip. I had very satisfying results with the standard UF5408 on the WD KT88 amp and never felt the need to use anything fancier. Hybrids, ok If you must for me but I will be perfectly happy with silicon. especially as this set up will be potentially delivering quite high currents at around 400V. I like hybrid bridges (with 6D22s damper diodes) for the slow warm up time, about 30 secs, which is a fair bit longer than the GZ series rectifiers. To see the HT ramp up gradually when the damper diodes warm up rather than the solid state instantaneous "wham" puts a lot less "strain" on things.